Ron & Freda Barber left their home in Brighton, England with their two children, Tony and Margaret, and departed Southampton on 11.5.1950 on the Asturias (Orient Line). 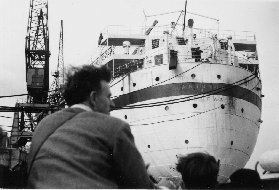 They arrived in Perth, Australia on Foundation Day, 5.6.1950, after a 3 week journey. They came to Australia with about sixty pounds. They were met at the Fremantle arrival terminal by Freda’s parents, brothers and sisters as they had emigrated two years earlier. They first stayed with Freda's parents, Arthur and Ada Taylor, in Egham Rd, Victoria Park. Freda went with her mother to purchase a block of land in Enfield St, immediately behind her parents’ house. Arthur and Ada had paid 50 pounds for their block just 2 years ago and it was quite a shock to Freda that hers was to cost 150 pounds. Nevertheless, the real estate agent showed her the plans for the suburb and convinced Freda that the price was not going to get any cheaper. Ron worked at building the house with the help of his brother in law. They first built a small wash house and lived in this from early 1951 while the house was being built, cooking on a primus stove and bathing Tony and Margaret in the wash troughs. The house took 2-3 years to build and, given that everyone in England had previously rented their house, was a major achievement for them. Ron's first job in Australia was a 2nd Class Welder with Structural Engineering. It paid seven pounds/week, a better wage than he could get in England. One of the reasons for coming to Australia was the ability to earn more money (Freda's parents had been writing back to England telling them of this). Whereas in England they were living week to week (the rent alone was 1 pound 6s/2d per week out of a wage of 4 pounds) they now had money left over to save. In 1961 Ron obtained his Supervisors certificate in Electric Arc Welding. He stayed with Structural Engineering for 22 years becoming Leading Hand and then Supervisor. He had just been put on as staff when the firm collapsed in 1972. This was very disappointing for Ron, but with only a few years to go to retirement, he worked as a welder at the Forward Down factory becoming involved in the Australian Metalworkers Union as a shop steward. He retired in 1979 at 60 years of age. I remember him taking me to the factory one weekend to see the results of a major welding project they had done – huge cylinders & tanks loaded up on long semi-trailers about to be driven up north to a mine site. I remember being very impressed after counting the number of wheels on the semi trailer. Ron enjoyed a beer, and a bet on the horse races. He was a member of the Perth Football Club for a period of time, and later in life tried bowls at the Lathlain-Carlisle Lawn Bowling Club. In retirement he enjoyed his time at home. He also enjoyed listening to records of Frank Sinatra, Tijuana Brass, Black & White Minstrel Show, Sound of Music, etc. and, of course, watching the television. Ron returned to Brighton to see his parents in 1970 and in 1976 (Ron & Freda). Ron really missed his family and the social aspects of his earlier life in England. He often said that the best job he ever had was when he was working on the buses in Brighton where he was meeting people all the time. The isolation caused by life in the suburbs and working in a factory in Australia during the 50s & 60s created some regrets. It is fair to say that their descendents owe Ron and Freda a debt of gratitude for the sacrifices and hardships they endured. Their children and grandchildren are now reaping the benefits of their decision to move to Australia. This story was posted by Ron and Freda's son, Geoffrey Barber, who can be contacted via the website administrator.